Return and exchange requests (RMAs) must be created within 30 days of your original order date. All merchandise must be returned unopened, unused and in the original packaging. All original hangtags, stickers and original bindings must be present and unaltered. Returns are never accepted on used merchandise. If you are having difficulty with human hair, click here. You may not return or exchange Custom Orders or Sale Items. Shipping and handling on returned merchandise is non-refundable unless you have received damaged or incorrect merchandise. Return processing time may take 2 to 3 business days. If you created your order as a guest, you will need to associate your order with an account so it can be tracked. 2. Add your order ID, billing last name, and either your zip code OR your email address. 3. Once you click "Continue," you will be able to follow the prompts through the steps below. 1. To create a return or exchange, login to your customer account. 2. Click on Product Returns, then select "Request a New Product Return." 3. 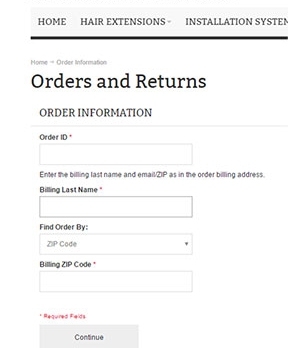 Select the order, the select the details for the items you wish to return. After we get your merchandise, we process it according to the instructions you’ve given us in your RMA request. You have nothing left to do but kick back and wait for your refund or new items. • Packages that are returned to us as “Refused” or “Undeliverable” by the carrier are not eligible for a shipping refund. • Re-shipping is subject to additional shipping charges. • You may select any of our shipping methods for re-shipping. If you have any questions or concerns, please contact us at (509) 326-7100 or sales@doctoredlocks.com . Our customer service representatives are always happy and ready to assist with even the smallest detail.